Someday, just as I sometimes do with my own father, who’s been gone for over thirty years, my older son Alex, now twenty-three, will recall occasions, after I’m gone, when he and I went out to hear live music together, like, for instance, last night, when we saw this group, from Africa, who are on their first U.S. tour. More Group Doueh? Here. More Tony Allen? Here. I live in Dakhla [in Western Sahara]. There are other groups in the area, but Group Doueh is the main group for this area. We are the most in demand group for weddings and parties. The power of Jimi Hendrix’s guitar is something that is inspirational on so many levels. The main group is myself on guitar and tinidit. My wife Halima and friend Bashiri are the vocalists. My son Jamal is the keyboardist. There are also many percussionists that play with us from time to time. Also other singers will perform with us depending on who is available for certain weddings or parties. For many years, most of our material was recorded on cassette. I have had many cassette recorders, some two-track, four-track and eight-track models. Now I am able to record digitally to a 16-track model. I am always experimenting to get the best situation. We always record at home and we record all of our performances. [T]here really is no [music] industry [in Western Sahara]. I am an industry unto myself. I record music and have two shops that sell music to the community. Most of the recordings are done at home in makeshift studios, and cassettes or CDs are sold throughout the region. The greatest jazz musicians—Miles Davis, Ornette Coleman, Von Freeman, et al.—can be identified by just one note. 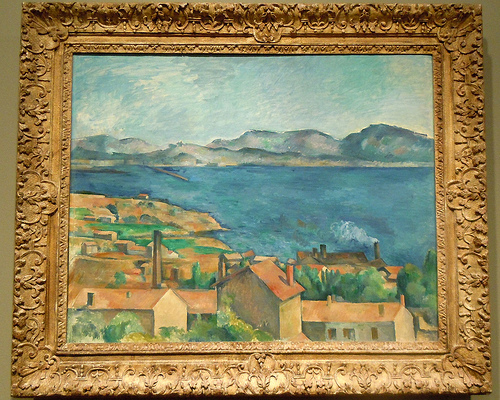 Cezanne’s that way, too. His blues are all his own.